It's a little before 6 a.m. now, as you unlock the door and enter the company office at the northeast corner of the Clipper Aviation hangar. You're one of three partners who own and operate Clipper Aviation, a small but prospering general aviation firm here at Brackett Field in La Verne, California. Out of this hangar, you and your partners operate a small fleet of light planes, which you manage to keep busy with flying lessons, rentals, charters, sightseeing, and air-taxi flights. This week it's your turn to open up early, but since it's such a perfect spring morning, you really don't mind. As you roll up the window shades to admit the pale rays of morning sunshine, you notice Runway 26 Left is already getting some action. You sit back behind your desk, prop up your feet, and peel the plastic lid from the styrofoam take-out cup you picked up at the fast-food place on your way to the field. Then you pause, gazing absently out across the ramp while you savor the coffee aroma now steaming up from the open container. You take a sip of coffee, glance out across the field again, and suddenly stiffen. That kid is at it again—the one with the red-and-white Cessna 150. You find yourself holding your breath as you watch his wavering final approach to 26 Left. He noses down, picks up speed, swoops up, slows, seems ready to stall, noses down again, begins to level off, and suddenly drops like a rock. The airplane's tires squeal out in protest as it hits the pavement, and it bounces back into the air like a rubber ball. But then the engine roars to full power, and you sigh with relief as the Cessna begins to climb away: The fledgling pilot will live to try again! You shake your head, pondering the life expectancy of the Cessna's tires. You're just spreading the day's schedule out before you on the desk when the telephone jangles to life. The call is from an oil company executive who needs a quick ride to L.A. He and an associate have an important meeting at eight, but engine trouble has grounded the company's business jet. You assure him you can have them at Los Angeles International Airport well before 7:30, and they agree to be at the Clipper hangar in 15 minutes. Although the weather is obviously perfect, you call Flight Service for a weather briefing; failure to do so would be foolish as well as illegal. 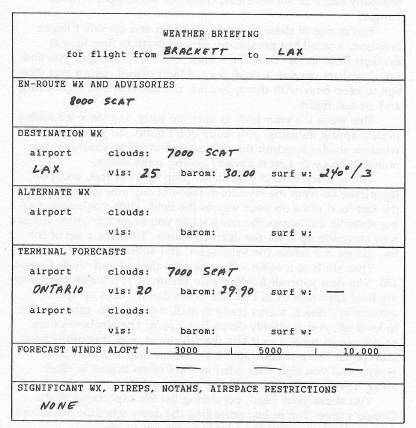 While on the phone, you scratch a few notes on a weather briefing form, thank the briefer, and glance at your charts to prepare for this short and familiar trip into LAX. 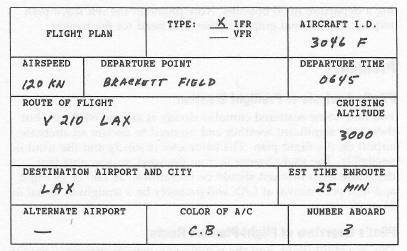 You quickly fill in a flight log and a flight plan form, estimating a departure in 30 minutes. Now phone in the IFR flight plan request, take a final gulp of coffee, and head for the hangar. You note some scattered cumulus clouds at around 8000 feet, but there's no significant weather and no need to declare an alternate airport on the flight plan. The barometer is steady and the wind is negligible. The slight breeze is from the west, so you note that departure from Brackett should be on Runway 26 Left or 26 Right and that your arrival at LAX will probably be a straight-in visual to 24 or 25. This is a short flight, and the routing you usually request is simply Victor 210 to LAX. Airway V-210 runs from the Pomona VOR, which is right here at Brackett Field, all the way to LAX. From Pomona, it follows R-224 for about 15 miles to Baset Intersection. Baset is the fix where Pomona's R-224 intersects Los Angeles R-248; at that point, the Airway turns right onto R-248, which it follows to LAX. 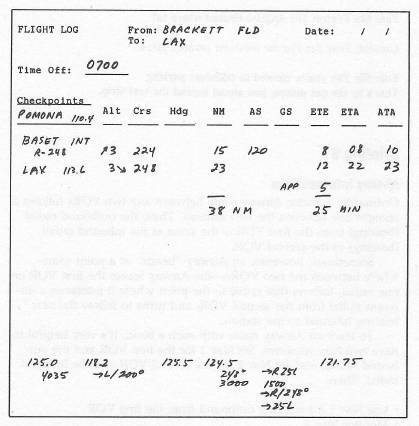 Baset Intersection is therefore the logical intermediate checkpoint for the flight log, and it's the only checkpoint you ever use on this short hop. Passengers are aboard and strapped in, doors are latched, the engine is running, the flight log is on your lap, and your chart is at hand. Nav 1 is on 110.40 for Pomona R-224, Nav 2 is on 113.60 for LAX R-248. You've called Ground on 125.0 to get your clearance, and now you're ready to copy. Squawk four zero three five. Set the transponder, read back the clearance, and indicate you're ready to taxi. Four Six Foxtrot cleared to taxi for 26 Left. Four Six Foxtrot contact Tower on one eighteen point two so long. Hold short of Runway 26 Left. Four Six Foxtrot position and hold. On one twenty-five point five good day. Climb and maintain three thousand. 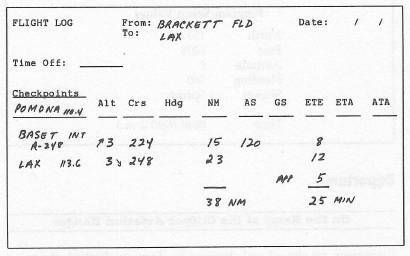 Ah Forty-Six Fox what's your ETA at Baset please? On one twenty-four point five good day. Heading two four eight degrees. Expect visual approach Los Angeles Runway 25 Left. Contact ground on one twenty-one point seven five good day. Switch to Ground and check in. Four Six Foxtrot Los Angeles Ground where to? Ground, Four Six Fox for transient parking please. That's by the gas pumps, just ahead beyond the taxi strip. Ordinarily, a Victor Airway route between any two VORs follows a straight line between the two stations. Thus, the outbound radial (bearing) from the first VOR is the same as the inbound radial (bearing) to the second VOR. Sometimes, however, an Airway “bends” at a point somewhere between the two VORs—the Airway leaves the first VOR on one radial, follows that radial to the point where it intersects a different radial from the second VOR, and turns to follow the new bearing inbound to the station. Use Nav 1 for tracking outbound from the first VOR. When the Nav 2 needle centers, you're at the intersection. At that point, turn to the new (inbound) bearing. Use Nav 2 to track inbound to the station. Once you're established on the inbound radial, you can transfer the Nav 2 settings to Nav 1, if you wish, just to maintain a consistent manner of using the Nav receivers. Many airports—especially smaller ones without control towers—provide an informal Unicom radio frequency for general advisories. The airport's fixed-base operator (FBO) usually provides the service on these Unicom frequencies, letting pilots in the airport vicinity obtain general runway and traffic information.